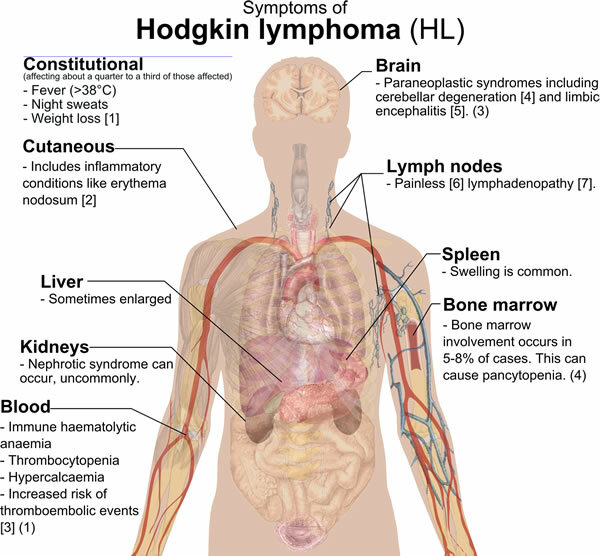 Hodgkin’s disease, also called Hodgkin’s lymphoma, is a type of cancer involving tissues of the lymphatic system, or lymph nodes. Its cause is unknown, although some interaction between individual genetic makeup, family history, environmental exposures, and infectious agents is suspected. Hodgkin’s lymphoma can occur at any age, although the majority of these lymphomas occur in people aged 15–34, and over the age of 60. Lymphoma is a cancer of the lymphatic system. Depending on the specific type, a lymphoma can have any or all of the characteristics of cancer: rapid multiplication of cells, abnormal cell types, loss of normal arrangement of cells with respect to one another, and invasive ability. Hodgkin’s lymphoma usually begins in a lymph node. The node enlarges and—similar to enlarged lymph nodes due to infectious causes—may or may not cause any pain. Hodgkin’s lymphoma progresses in a fairly predictable way, traveling from one group of lymph nodes to another unless it is treated. More advanced cases of Hodgkin’s involve the spleen, liver, and bone marrow. The features and prognosis of patients with Hodgkin’s disease and non-Hodgkin’s lymphoma (NHL) differ significantly. However, research in 2001 found that among patients with human immunodeficiency virus (HIV), Hodgkin’s disease appears very similar to HIV-related non-Hodgkin’s lymphoma. NHL occurs much more often in patients with HIV, but in recent years, a small but significant increase in Hodgkin’s disease has been seen in HIV-infected patients. Constitutional symptoms—symptoms that affect the whole body—are common. They include fever, weight loss, heavy sweating at night, and itching. Some patients note pain after drinking alcoholic beverages. As the lymph nodes swell, they may push against nearby structures, resulting in other local symptoms. These symptoms include pain from pressure on nerve roots as well as loss of function of specific muscle groups served by the compressed nerves. Kidney failure may result from compression of the ureters, the tubes which carry urine from the kidneys to the bladder. The face, neck, or arms may swell due to pressure slowing the flow in veins that should drain blood from those regions (superior vena cava syndrome). Pressure on the spinal cord can result in leg paralysis. Compression of the trachea and/or bronchi (airways) can cause wheezing and shortness of breath. Masses in the liver can cause the accumulation of certain chemicals in the blood, resulting in jaundice—a yellowish discoloration of the skin and the whites of the eyes. As Hodgkin’s lymphoma progresses, a patient’s immune system becomes less and less effective at fighting infection. Thus, patients with Hodgkin’s lymphoma become increasingly more susceptible to both common infections caused by bacteria and unusual (opportunistic) infections caused by viruses, fungi, and protozoa. Diagnosis of Hodgkin’s lymphoma requires the removal of a sample of a suspicious lymph node (biopsy) and careful examination of the tissue under a microscope. In Hodgkin’s lymphoma, certain characteristic cells—Reed-Sternberg cells—must be present in order to confirm the diagnosis. These cells usually contain two or more nuclei—oval centrally-located structures within cells that house their genetic material. In addition to the identification of these Reed-Sternberg cells, other cells in the affected tissue sample are examined. The characteristics of these other cells help to classify the specific subtype of Hodgkin’s lymphoma. Once Hodgkin’s disease has been diagnosed, staging is the next important step. Staging involves computed tomography (CT) scans of the abdomen, chest, and pelvis, to identify areas of lymph node involvement. In rare cases, a patient must undergo abdominal surgery so that lymph nodes in the abdominal area can be biopsied (staging laparotomy). Some patients have their spleens removed during this surgery, both to help with staging and to remove a focus of the disease. Bone marrow biopsy is also required unless there is obvious evidence of vital organ involvement. Some physicians also order a lymphangiogram—a radiograph of the lymphatic vessels. Staging is important because it helps to determine what kind of treatment a patient should receive. On one hand, it is important to understand the stage of the disease so that the treatment chosen is sufficiently strong to provide the patient with a cure. On the other hand, all the available treatments have serious side effects, so staging allows the patient to have the type of treatment necessary to achieve a cure, and to minimize the severity of short and long-term side effects from which the patient may suffer. Hodgkin’s disease is a life-threatening disease. A correct diagnosis and appropriate treatment with surgery, chemotherapy, and/or radiation therapy are critical to controlling the illness. Acupuncture, hypnotherapy, and guided imagery may be useful tools in treating pain symptoms associated with Hodgkin’s. Acupuncture involves the placement of a series of thin needles into the skin at targeted locations on the body known as acupoints in order to harmonize the energy flow within the human body. In guided imagery, the patient creates pleasant and comfortable mental images that promote relaxation and improve a patient’s ability to cope with discomfort and pain symptoms. Other guided imagery techniques involve creating a visual mental image of the pain. Once the pain can be visualized, the patient can adjust the image to make it more pleasing and thus more manageable. A number of herbal remedies are also available to lessen pain symptoms and promote relaxation and healing. However, individuals should consult with their healthcare professionals before taking them. Depending on the preparation and the type of herb, these remedies may interact with or enhance the effects of other prescribed medications. 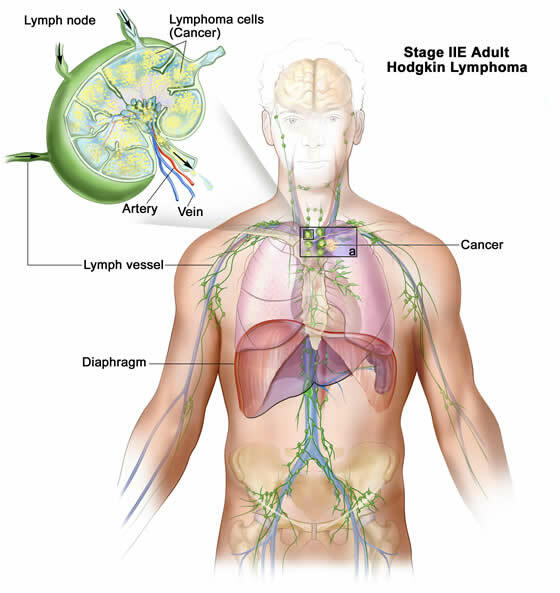 Treatment of Hodgkin’s lymphoma has become increasingly effective over the years. The type of treatment used for Hodgkin’s depends on the information obtained by staging, and may include chemotherapy (treatment with a combination of drugs), and/or radiotherapy (treatment with radiation to kill cancer cells). Both chemotherapy and radiation therapy have unfortunate side effects. Chemotherapy can result in nausea, vomiting, hair loss, and increased susceptibility to infection. Radiation therapy can cause sore throat, difficulty in swallowing, diarrhea, and growth abnormalities in children. Both forms of treatment, especially in combination, can result in sterility (the permanent inability to have offspring), as well as heart and lung damage. A 2003 study showed a link between radiation therapy for Hodgkin’s disease and increased risk for later breast cancer. However, adding chemotherapy to the regimen decreased the chance for breast cancer, perhaps by inducing premature menopause. Hodgkin’s is one of the most curable forms of cancer. Current treatments are quite effective, especially with early diagnosis. Children have a particularly high rate of cure from the disease, with about 75% still living cancer-free 20 years after their original diagnosis. Adults with the most severe form of the disease have about a 50% cure rate. In 2003, new research noted that even after complete remission, some patients showed signs of thyroid dysfunction, most likely from the immune problems caused by Hodgkin’s disease. The researchers recommended thyroid examinations every year during follow-up of the disease. While Hodgkin’s disease cannot be prevented, researchers continue to study risk factors for the disease. In 2003, a study showed a possible link between exposure to the measles virus around the time of pregnancy or birth. As research continues, these and other discoveries may help people control certain risk factors for Hodgkin’s disease and other cancers.